The Troy Bilt Storm 2840 Snow Blower is one of the biggest snowblowers available from Troy Bilt. It is far bigger than it’s smaller brothers like the Troy Bilt Storm 2410 Snow Blower or the Troy Bilt Storm 2620 Snow Blower. It is powered by a Troy Built engine that is 0.28 liters in size. It’s a 4 stroke engine which means the oil is added separately to the engine and you are not required to do any of the mixing. This engine transfers power to the wheels via an all wheel drive transmission. This all wheel drive transmission provides the 2840 snowblower with 6 gears when it’s traveling forwards and 2 gears for when it’s reversing. For operator comfort, the handles on the Troy Bilt Storm 2840 snow thrower include heaters so that if you do need to operate the machine for long periods of time, at least your hands won’t freeze! The chute is highly adjustable and via a 4 way joystick that allows the operator to quickly and easily move it up or down and left or right. Another great feature about this machine is that you can control it with just one hand. The Troy Bilt Storm 2840 snowblower also has a halogen headlight to allow you to use the snow thrower even when it’s dark outside. The total clearing width of the 2840 comes to 0.71 m (28 inches) while it has an intake height of 0.53 m (21 inches). As you can imagine, this is a very big machine indeed and as such it’s quite popular with snow clearing companies and contractors. It’s not that popular with individuals for the simple fact that it’s just so big. If you are an individual looking for a snowblower more suited to your needs, the you should check out a model like the Troy Bilt Squall 210 Snow Blower or even the Troy Bilt Squall 2100 Snow Blower. 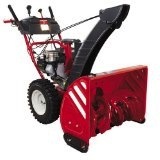 Click Here to buy the Troy Bilt Storm 2840 Snow Blower.